Freshwater snails seem to bring out various different opinions from most fish keepers, they are one of those creatures that people seem to love or hate with no happy medium. Are they really beneficial to the aquarium? I think so in my personal view as they do a great job of turning over the substrate releasing trapped gases and munching away on detritus and rotting plant life in the fish tank, many people are put off as some species can strip plants and believe me if given the opportunity, most species of snails can breed like mad, but in more cases than not this is often the fault of the fish keeper but this will be covered later in the article. If you are setting up a saltwater tank and wish to add a clean up crew what are the first creatures that spring to mind, crabs and snails, there is no doubt in the world of the saltwater fish keepers about the benefits of the snails so I do find it hard to understand why freshwater fish keepers are so often opposed to them. Snails are unique and are found all over the world, often surviving in the harshest of conditions, some species have wonderful markings and some species even seem to have their own personalities! But what do we know about the snails that inhabit our planet, well the first obvious feature is the complete lack of a skeleton, some people are mistaken thinking that their shell is some form of exo-skeleton, this is not the case, the shell of the snail is used for protection and offers a retreat if the snail feels threatened, many species even have a trapdoor ( this is known as the operculum)so that they can enclose themselves completely. 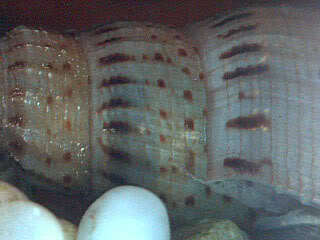 The shell is produced from the mantle of the snail who secretes special liquids which harden in time and build up to produce their unique home. All snails belong to the Mollusc family and some snails are completely able to move around while a few species have to make do with sticking to a surface in the same place for all of their life. They move by a special muscle that runs along the bottom of the body and this is known as the foot, it is a muscle that send ripples along its length to create the movement albeit this is usually very slow paced. They will eat virtually anything and make a grand job of cleaning the substrate in the aquarium, some species thrive on algae as well, a bonus to any fish keeper! Think what life would be lie if we had a miniature vacuum cleaner in our fish tanks, well to me this is exactly what snails are. They thrive on digesting rotting plant leaves, uneaten fish food and even rotting corpses of dead fish (hopefully this is not a common occurrence for you). They clean the glass, décor and substrate of detritus and in some cases do a superb job of eating through unwanted colonies of algae. They digest their food by rasping away with small, grinding teeth in their mouth which reduces their food source to smaller particles to make it easier to digest. Using snails as a clean up crew reduces the amount of tank maintenance that you have to perform but I also like to observe the snails, they come in a variety of sizes and different species produce different shells that can also come in a great variety of colours. No two snails will produce exactly the same shell! Unfortunately snails will breed at every opportunity that they have, the correct water, an abundance of food and they will multiply, with some species this can be at an alarming rate as the lay thousands of eggs with each batch. If we control their food input this is often enough to keep the snail population in check so make sure that you only feed the fish the correct amount of food each session, if you do accidentally overfeed, syphon out the excess. Even if you think that it is too late and the tank is swarming with snails you can easily remove most of them with a couple of simple methods. There are commercial treatments available that claim to eradicate snails but from my own experience I find that they simply stun the snails and long term they do not solve the problem, a bad side effect is that the same treatments can also affect the beneficial bacteria in your filters, reducing their efficiency, the last thing that you want when the tank is fully cycled. I have fund it much simpler to syphon out any unwanted snails when performing water changes or even lay traps for them. There is even a device now available that is designed to trap the snails, you load it with some irresistible food and the snails enter of their own accord. Placing a glass on its side in the aquarium can also do the same trick, just remove the glass every morning and the feeding snails are removed at the same time. If after reading this article you are still set against having any snails in your aquarium you will need to prevent them from getting in there in the first place. The eggs or even young snails are often introduced when plants or suchlike are added, checking the plants beforehand will reduce the risk but there is always the chance that you may have missed the odd egg. Soaking the plants in a salty solution or even a diluted bleach solution for a few minutes will kill off any unwanted hitch-hikers but always remember to rinse the plants thoroughly before adding them to your aquarium.